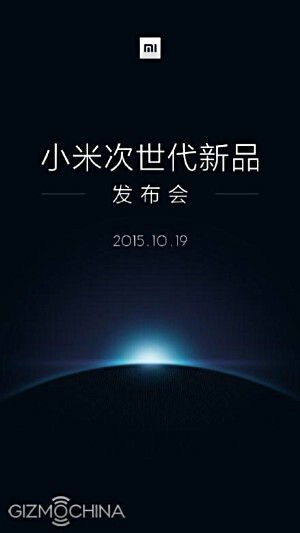 Xiaomi has sent out press invites for an event next week. While a teaser image accompanying the invite (shown below) suggests a new product launch on October 19 (next Monday), there isn't much known about it at the moment. The most likely candidate is the Mi 5 smartphone, which has been the subject of numerous rumors and leaks till now. Although previous reports have suggested that the device would be launched either in November or December, an October launch cannot be completely ruled out. However, if this does happen, it'd be safe to say that the handset won't feature the Snapdragon 820 SoC as the first devices with the chipset are expected to arrive in December at the earliest. Another possible launch candidate is the Mi Pad 2. There were reports earlier that the device could be announced in Q3, a time frame which has already passed. However, that time-frame was never confirmed by Xiaomi, so an October 19 launch for the Mi Pad 2 is still a possibility. The successor to the Mi Pad was also recently spotted on China's 3C Certification center website. Whatever be the case, we'll come to know soon as October 19 is just a week away. Well said, and I would like to add the timing issue here. Launching a flagship device with current top chipset, when the next upcoming chipset is just around the corner, is surely gonna raise some eyebrows.